For ski enthusiasts, nothing says luxury so much as a beautifully positioned ski in, ski out home. Breckenridge offers an array of ski in, ski out opportunities; condos, townhomes and single family homes for sale. Ski in, ski out properties are a great investment; both for the memories which will be created as well as the great appreciation and potential rental income. Breckenridge ski in, ski out properties are and will always be in great demand. 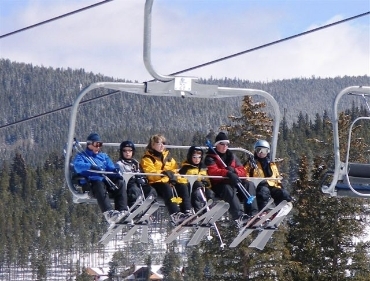 There are a few different types of ski in, ski out Breckenridge properties. For instance, some complexes and neighborhoods have ski in, ski out access via the Four O'Clock Run and Skyway Skiway Run. Such areas include Los Pinos, Elk Ridge Townhomes, Estates at Snowy Point, Pine Ridge Condo, Park Place, Pines at Four O'Clock, Saw Mill Condos, Saddlewood, Saw Mill Patch Townhomes, Ski Home Breckenridge, Sundowner, Twin Elk Condos and Mountain Thunder Lodge. Residents of Warriors Mark have ski out access via the Burro Trail. There are also Breckenridge locations which are truly ski in, ski out in all senses of the word. Throw your skies on and push off from your back door. These locations include Beaver Run Condos, Cedars at Breckenridge Townhomes, Liftside Condo, Plaza Three Condo, Timber Trail Sub, Trails End Condo, Tyra Sub ,Tyra At Riverbend Lodge,and Village at Breckenridge. New Breckenridge Ski In, Ski Out Developments are also a very popular choice. These projects include Fairmont Residences Shock Hill, Cottages at Shock Hill, Blue Sky Breckenridge, Crystal Peak Lodge, Shock Hill Homes Condo, <Shock Hill Sub, and One Ski Hill Place. Looking for ski in, ski out Breckenridge condos and homes for sale: Search our local listings database for access to listings in Breckenridge and surrounding communities. Whether you want to buy or sell real estate in Breckenridge, you can browse through properties or find a variety of real estate resources on this website.